From staffing to linens...from china to tents... contacts for flowers, invitations, party favors and decor...we can help make your party a fantastic success! 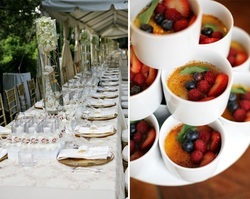 Be it an intimate dinner for two, or an elegant affair for 200, Izenberg's will create the most delicious foods with a beautiful presentation at the most competitive prices! Contact us for price quotes and more information. Click here to view Sherry Paskin's delectable creative centerpieces at her complete web site. Sweet Surprises specializes in creating custom candies for events and parties. 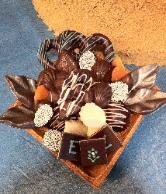 ''Allow us to make the tables at your special occasion even more beautiful, with our hand-dipped chocolates. Click here to view the Facebook page for Castles in the Sky - a fabulous live musical duo. Upcoming performances are promoted on this page, so you may go see for yourself!